Breast cancer affects millions of people worldwide, and it’s a disease that we’re determined to help eradicate as soon as possible. That’s why we are spending Breast Cancer Awareness Month doing everything we can to raise awareness of the disease and its treatment. If you see our team members sporting pink floor savers on all of their calls this month, that’s why! We hope that you will join us in supporting those engaged in the fight against breast cancer (including our own survivor and Customer Service/Warranty Specialist Terry Kizzire!) as well as those searching for a cure. 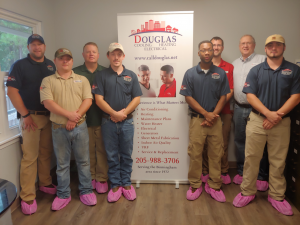 Posted in Announcement | Comments Off on Douglas Cooling & Heating Supports National Breast Cancer Awareness Month!